Social Media usage has grown exponentially in the last several years across the world with Facebook, Twitter and a slew of other new social media sites registering members in millions. Communicating openly and freely with one another easily at anytime without any boundaries (cultural/geographical) has been one of the major attractions of the Internet. From early on, there have been online communities where people gathered to talk about various subject matters or simply to ‘hang out’. Over time, this blossomed into today’s diverse social media where a tweet or picture from one part of the world can mobilize millions of people into action from every corner of the earth. In academic research, we are still grappling with understanding how, why and in what ways social media impact our society. 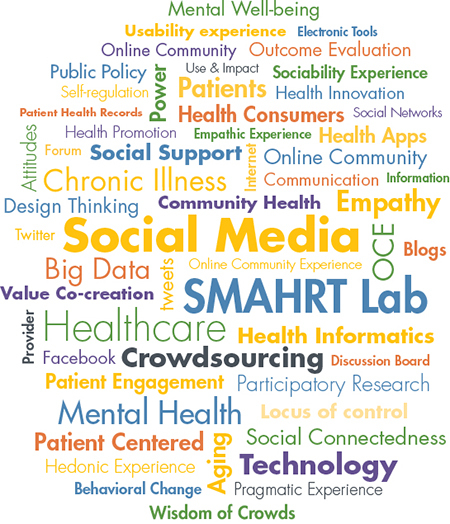 The objective of the SMAHRT lab is to bring together researchers who are interested in social media research or are interested in using social media as a platform for their research. Students (undergrads and grads) are an important part of SMAHRT lab, and there will be plenty of opportunities to participate in research.